An 8123 Community blog by Paige Williams. I spend hours every week thinking about my future The Maine tattoo. I know the day is coming. My plan is to do it at 8123 Fest because, y’know… it feels appropriate. But there’s no other band I’d feel this comfortable wearing on my body for the rest of my life. I want nothing more than to visibly show the mark they’ve left on me through their music & their message. No matter what’s happening in my life, I can always rely on one of their live shows to bring me back to earth. I know I’m not the only one who feels this connection to 8123. In fact, I don’t know many other fanbases quite like our community. Who else has flown to the desert and prioritized taking an Uber to a random industrial area so you could hang out at their parking garage and cry? I think… I think that’s just us. But don’t take my word for it. 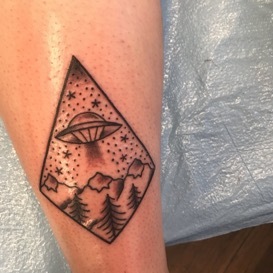 I put out a call for 8123 tattoos on Twitter and collected stories that *spoiler alert* made me cry. A lot. Grab some tissues and read on! 2. I feel like people correspond aliens with being weird or out of place. I have seen The Maine in 5 different states with my 3 best friends and so the song “Another Night on Mars” really hits home for me. The lyrics "what's another night on Mars with friends like ours? Anywhere is home" and "this one goes out to my closest friends, the ones who make me feel less alien" are the lyrics that really tie into my tattoo. Anytime I'm traveling with my girl squad for shows -- whether it's to see The Maine or another band -- that is when I’m happiest. I never really miss home when we're away at shows, because I'm with my best friends doing my favorite thing in the world. When deciding what I wanted my first tattoo to be, I had multitudes of ideas, one of which being the number 8123. 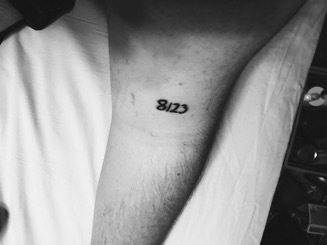 Always hearing stories about tattoo regret and “meaning,” I knew 8123 was a number I would never regret getting tattooed, nor feel as though had minimal meaning. To me, 8123 is more than just a collective of artists, bands, and various music; but rather a feeling. A feeling of not only happiness, but nostalgia, closeness, inspiration, and even family. 8123 has provided me with some of the fondest memories of my life and some of the greatest people in my life. So even in 20 years if I am no longer listening to music produced through 8123, I never want to forget this feeling and what has come along with it. In harder times, it serves as a reminder that things are fine and I’ll figure it out, and that what ever I may be dealing with, it is possible to feel that feeling again. So I got this tattoo because, as cheesy as it sounds, 8123 does mean everything to me. A majority of my best friends have come from 8123 and The Maine. 8123 truly makes me feel like I have a place in this world and can make me feel better on the shittiest of days. We were friends for 7 years before we met for the first time at 8123 Fest. The song “Another Night on Mars” was one that I loved but wasn’t something I was super connected to until I heard it at the fest. During the opening (and recurring) lines of “this one goes out to my closest friends, the ones who make me feel less alien, I do not think I would be here if not for them” I was just holding Sarah and thinking about how important her friendship had been to me all those years, during my deep depression and struggles with mental illness. It really connected that I did not think I would be here, alive, if not for her. I was a sobbing mess as the crowd sang along and I got to be there singing along with my best friend that I had just met despite knowing for about a third of my life. But when we decided to get the tattoos, it was a long running thing. We weren’t exactly sure what to get at first, just knew we wanted to get something. We spent months looking at different tattoos and thinking. Eventually I feel like we decided we were both so inspired and connected to ANOM and it was really like our song so we should get something to symbolize it. I was gonna get Mars and she was gonna get the moon so together it was “night” and “mars.” But then Sarah had the idea to put them together. So I made us a design and Sarah came to New Orleans for the first time ever -- and our third time ever hanging out -- and we got the tattoos before seeing The Maine that night. And we got them on the wrists of the hands that we hold when singing along - my left and her right! So fast forward to 8123 Fest. We meet in person for the first time. It’s great. When they play ANOM, I turn around and we like make eye contact and just both start crying. It was so surreal. Then pretty much every time we heard the song we thought of each other. When they played in Houston, Meara had a migraine but came back to us during ANOM. It’s just basically our anthem. So when we were planning on seeing them in NOLA, originally I was getting the moon and Meara was getting Mars (we’d both always wanted the individual tattoos) but then realized we wanted to put both together... so we designed our tattoo. Then we got them in NOLA before seeing The Maine (on opposite hands cause we hold hands during ANOM). But basically it’s the “closest friends the ones that make me feel less alien” part and the “anywhere is home” part because we have to travel to see each other, but she’s my best friend in the world and anywhere feels like home/mars when we’re together. After the Lovely Little Lonely tour, I wanted something to commemorate this album and era of The Maine. I decided to get this rose to show how much this band means to me. This album means the world to me. It was the album that The Maine were promoting when they came to the Electric Ballroom on 26/9/2012 in Camden, where I saw them play for the first time. It was the album that got me through the difficult times in my life that followed. Playing that album became like a meditative mantra for me. It was an escape to a world in which I felt safe and happy. It was the album that reminded me to be an anthem for a dying breed, to be my true to myself and to fight for what I believe in. It reminded me to be a Pioneer. In all seriousness, “(un)lost” is a song that spoke to me and American Candy was an album that literally changed me. Basically I was completely void of feeling anything. I had my dream music industry job and after almost a decade of doing it, I ended up jaded and didn’t even like being a “fan” or love music the way I used to; American Candy flipped the switch for me. So I marked myself up a bit with these to remind me of that (VERY IMPORTANT) moment when I was actually able to feel and basically be a real human being again. As cheesy as it sounds, the entire AmericanCandy album and era helped me actually be “me” again. So yeah. Tattoos.